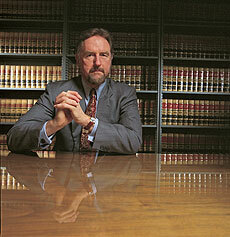 Craig Haney was an expert witness in the recent appeals-court case on prison overcrowding. Conditions inside California's vastly overcrowded prisons may finally improve, following a directive from an appeals court panel to slash the number of prisoners housed in the state. "The California prison system is in crisis and operating in a dysfunctional and dangerous manner," Haney wrote in a 220-page report submitted to the appeals panel. Conditions are "nightmarish," with many facilities now holding twice as many inmates as they were built to accommodate. Haney described cavernous gymnasiums converted to housing units, where tight rows of double- and triple-bed bunks extend "as far as the eye can see," precluding any privacy and making supervision impossible. On February 9, the judges called for a reduction to between 120 percent and 145 percent of the prison system's capacity, which would reduce the population by approximately 40,000 inmates over the next three years. The announcement came in the form of a tentative ruling, designed to give the state an opportunity to develop a plan to reduce the population to required levels. In his report, Haney, an expert on inmate mental health, described the various ways in which overcrowding was preventing the prison system from providing constitutionally required medical and mental health care. His report included accounts of interviews he conducted with many desperately mentally ill and even suicidal inmates whose needs were being ignored because of dire space and staff shortages that plague the system. Rates of inmate suicide appear to be escalating, and recidivism rates in the state are among the highest in the country, he noted. Haney testified twice during the trial: once about the harmful consequences of the overcrowding he saw during tours he conducted of a number of the prisons, and a second time advising the judges that the prison system could not operate safely or humanely without a reduction in the population to absolutely no more than 145 percent of its capacity. Prison experts believe the case is likely to be regarded as a landmark decision, in part because of its potential implications for other overcrowded systems around the county. It is also likely to be appealed by the state to the United States Supreme Court, said Haney.